Our children are all exceptionally lucky. They have been exposed in massive doses to their cultural heritages, here in New Zealand, in my native land Canada, and across the planet. They have trudged through the Grampians, visited the lochs, and picnicked along the river Dee in Scotland, all the while being told tales of their Lamb clan heritage. They’ve visited their frail old aunt on the banks of the Nieuwe Maas in Rotterdam and been told stories of their grandfather’s childhood on a houseboat there. Two of the three have been taken by train to Bavaria and Austria and served spaetzel by gorgeous women with high cheekbones, wearing lederhosen. They’ve driven the Irish countryside and watched their mother kiss the blarney stone (not that I needed the gift of the gab, heaven knows I already had it). They’ve seen native American Indian art and culture from the West Coast to the East of Canada and the USA, and told in vague terms that there are drops of that sacred indigenous blood in their veins, but the stories are not clear and we’re still trying to piece together which ancestral tribe(s) we may share DNA with. 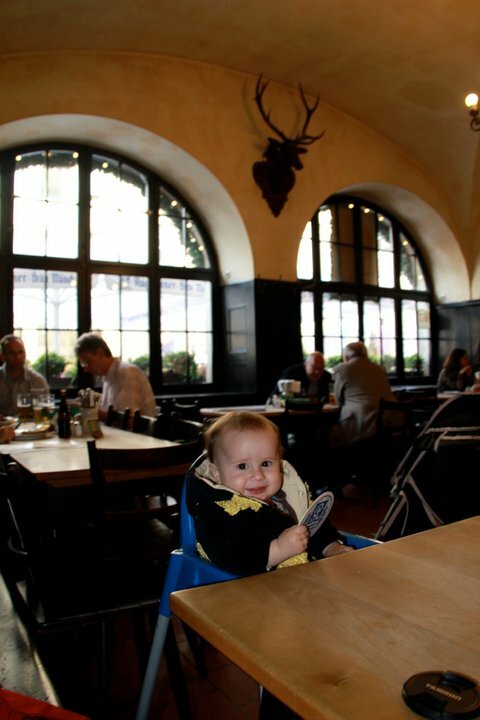 Here’s our third child dressed as a bumble bee in a bar in Bavaria. 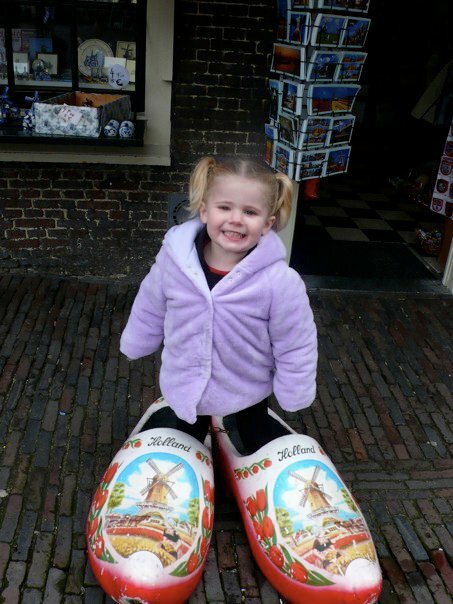 This is Steph when she was about three in Holland. 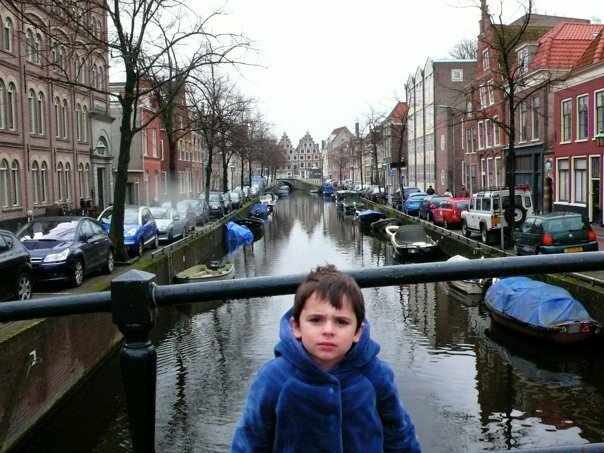 Daniel in Rotterdam… Thrilled as he frequently is. Such an emo sometimes. He’s been that way since birth. Love him just the way he is! There are other times when they are genuinely interested in their heritage, stories of where they came from, and knowing about their family history. Despite our best efforts to keep them connected with their vast and varied family roots, the two most recent pieces of their cultural substance stand out heads and shoulders above all their diverse ancestry. Our children very much identify as Canadian and Kiwi. Perhaps this is owing to the example we set, openly and frequently appreciating the fact we belong to this quiet, peaceful, and remote little nation nestled somewhere in the South Pacific. They have been privy to an absolutely idyllic childhood here. They ride their bikes in the lush green park across from their grandparents’ house. They pick seasonal fruit from the trees in the yard. They celebrate the seasons and snuggle in with blankets and hot porridge in the brief winter months of June, July and August, and climb trees and scrape knees throughout the rest of the year. 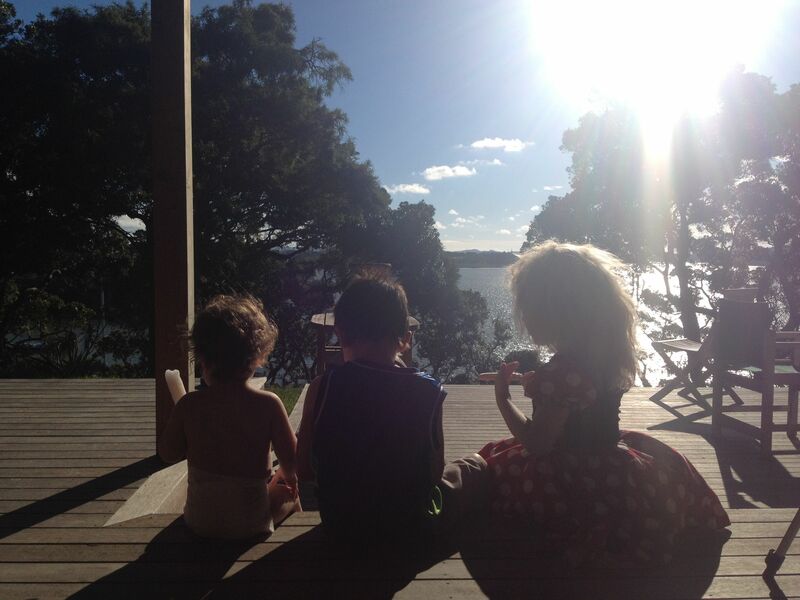 Here are the children eating an ice cream on our deck overlooking the harbour. Pleasingly proud of being “half Canadian, and half Kiwi – but you can call me a Caniwi” they have spent at least some part of every season in Canada, while predominantly residing since their births in Auckland New Zealand. 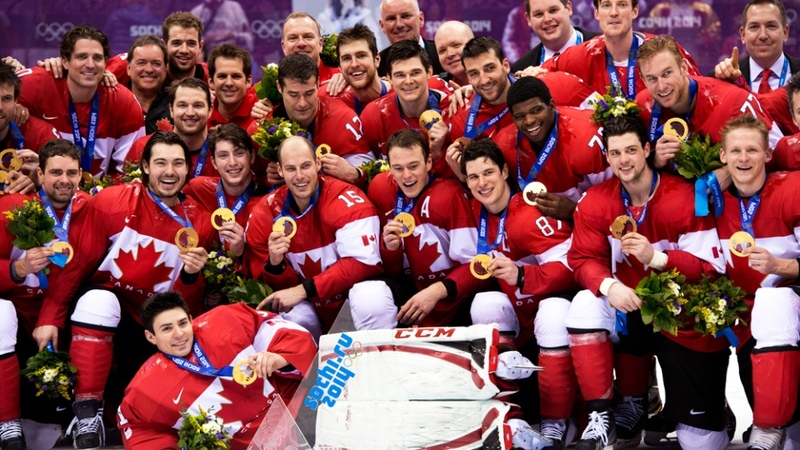 What got me thinking about all of this was an off-hand comment by a good friend who piped up with: “Oh, NOW you are a Canadian” when I congratulated the hockey teams (men and women it turns out) for winning gold at the recent Olympics. A light-hearts jab at the fact I will tell anyone who will listen just how amazing NZ is and how blessed we are to live there, yet when my native land does something noteworthy I am quick to proclaim my Canadianism. Well, sure. Why not right! My home and Native Land of Canada punches well above its weight at the winter Olympics, while my home of choice does the same at the summer games. Ironically though, I don’t actually watch any of it. Sport is not something that interests my family, but a bit of national pride and celebrating internationally noteworthy achievements like these, well, I’ll happily join in on that. The similarities between the two cultures that the children hail from are staggering. Canada and New Zealand have larger, louder neighbours that they constantly get compared to and pitted against. Not to state to obvious, but Canada shares the largest uncontrolled border on earth with the USA, while Australia is New Zealand’s largest and closest neighbour, with a mere 2153.61km separating the largest cities of Australia and New Zealand (Sydney and Auckland). Canada has many of our talented sons and daughters swallowed up by our economically and politically larger neighbour to the South, and many, if not most of our talent in business, entertainment, R&D and beyond jump the ditch or end up further afield as well. They often come back though. There’s something about this country that grabs hold of most people who are exposed to it and never, ever lets go. I am confident that our kids are going to have the option of chasing their dreams just about anywhere on earth those dreams may lead them. At this point, at least one of them is just biding their time until they are old enough to settle in Canada for an extended period, and that’s just fine as far as we are concerned. 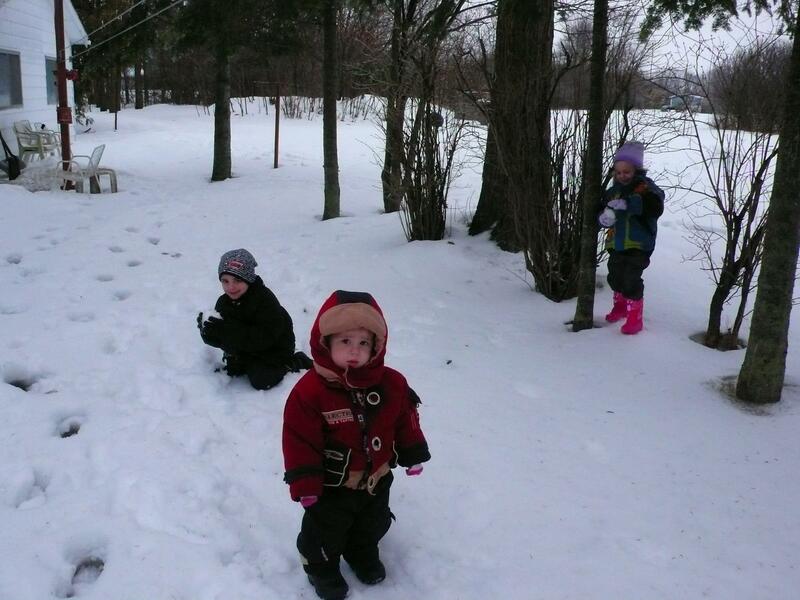 Our children have spent parts of their childhood, the same as I did, at my Grandfather’s cottage in Luskville Quebec. 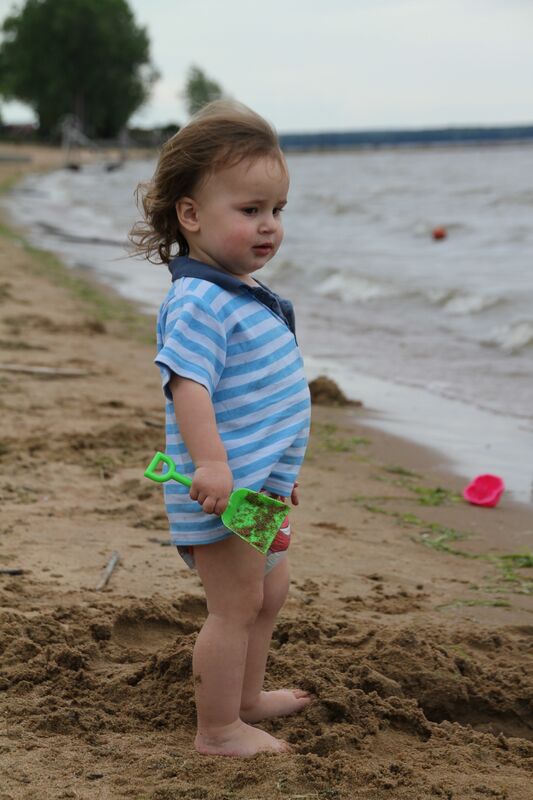 They have felt the same sand between their toes in Black bay as I was when I was a child, and they sample the same vast array of summer fruits and vegetables from his extensive gardens as I did when I was a child. And while they are there, they immerse themselves in their Canadian family and culture. It is a part of them, and they are a part of it. And then they return home to New Zealand. To a culture of tall poppies, rugby fans, bare feet, great things to eat, and plenty of peace and quiet in which our family can retreat. 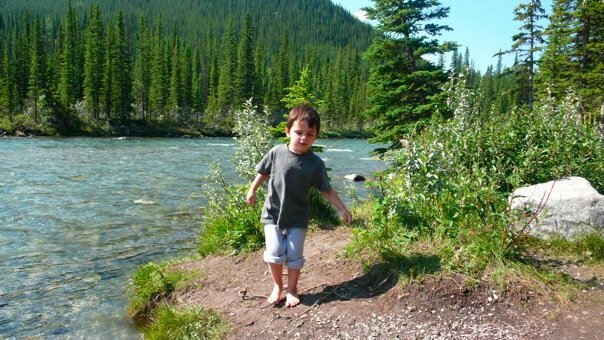 Our eldest son is fully intending on settling in Canada for an extended period when he is old enough to venture out on his own. Our daughter currently has plans of buying a caravan and filling it with food, medical and school supplies and helping people who need these things anywhere and everywhere that need may be. The third child just bides his time and adventures through life on his balance bike waiting for our next adventure, and the fourth and final son will slot into our story once he arrives. Many of their friends have a similar story, and live with one foot in New Zealand and another in some distant land like the UK, South Africa, Holland, Italy, China etc. Their families are cross cultural and even the ones who do not venture back overseas regularly observe customs and traditions from their non-kiwi heritage, all the while embracing the culture and lifestyle here as well. The most important thing I hope the kids glean from our extensive investment and efforts lugging them across the planet as we do is that they are miracles. Miracles of the fates of generations before them, and the Love between their parentage for the hundreds of years we have been able to trace back to. And that they are citizens of the planet, and parts of them come from many corners of the world, and therefore, it is absolutely imperative that they show Love and respect to the all the other citizens of this planet as well. Because every person they meet is also as miraculous as them. When we spin it to them like this, I like to believe that they genuinely comprehend the importance of respect and tolerance. I also truly believe that the two countries that they connect most readily with are places where diversity and tolerance feature heavily as a foundation in our political and social systems, as well as our communities for the most part. And our family works hard, both within our own walls, and in the way in which we conduct ourselves in society and the community at large, to encourage this tolerance and diversity. New Zealand is a country where ANYONE can marry, where we have (or had at one time) some of the best personal privacy and protection legislation on earth. 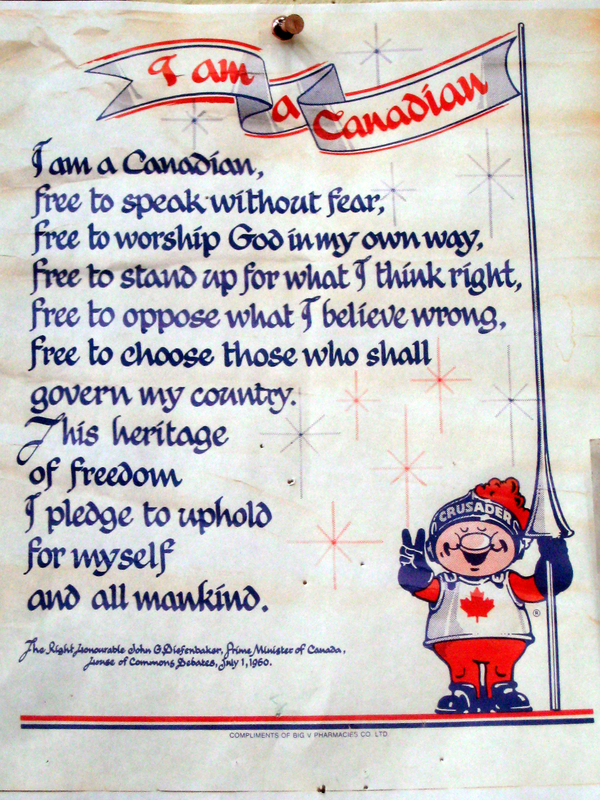 Both Canada and New Zealand welcome many political and social refugees, and enjoy a diverse range of cultures and religions who I believe genuinely try to co-exist and learn from one another. Two genuinely fantastic countries and cultures if I do say so myself. 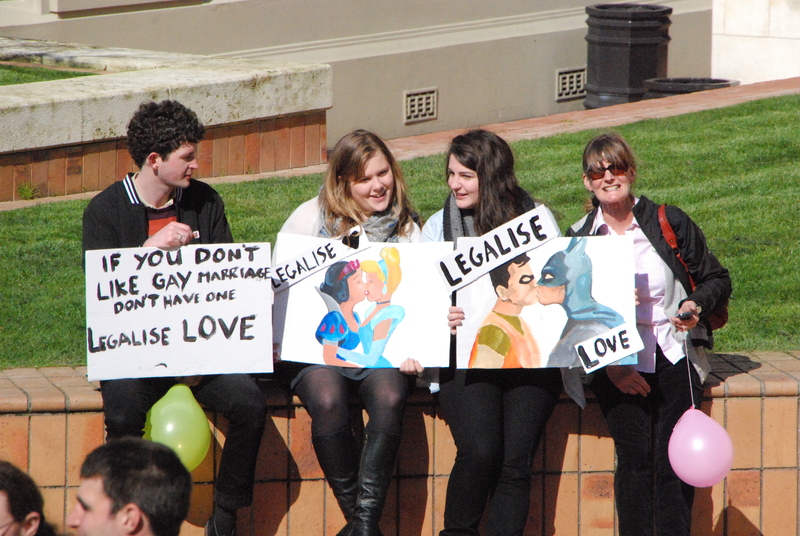 Peaceful demonstrations for marriage equality bill (which is now law!) Makes me awfully proud!!!! So that’s a little window into what we figure it is like trying to juggle a Caniwi family with a rich and varied mix of heritages. And not a day goes by that I don’t feel grateful for the opportunity to share these two amazing countries and cultures with them as we carve out a future together. I hope that the foundation of knowing where they came from, helps all of our children move confidently, filled with Love, tolerance and kindness to wherever their paths may take them.